What a glorious day! 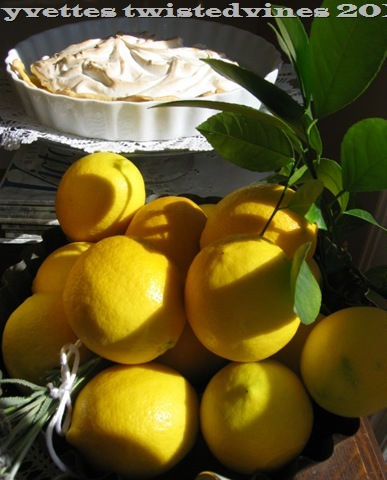 Sunshine beaming through the French windows over glowing freshly picked lemons, chamomile tea and a delicious lemon meringue pie. A touch of yellow for you my friends today. Yellow shines with happiness, enlightenment, joy, energy and sparks creative thoughts. A golden afternoon shared with you. 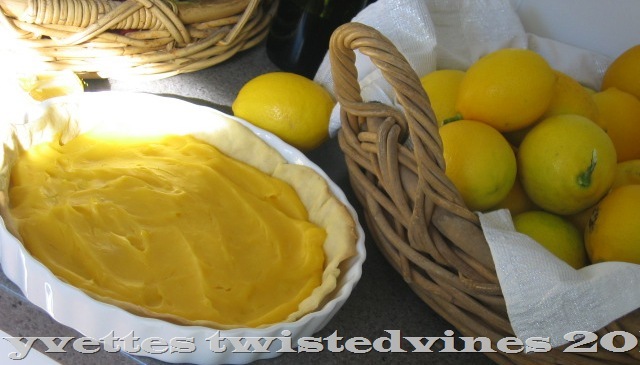 Read on for this beautiful tangy luscious pie recipe and some more sunshine! My table was dabbled by antique cutlery, antique cookie cutters and tins, lace. 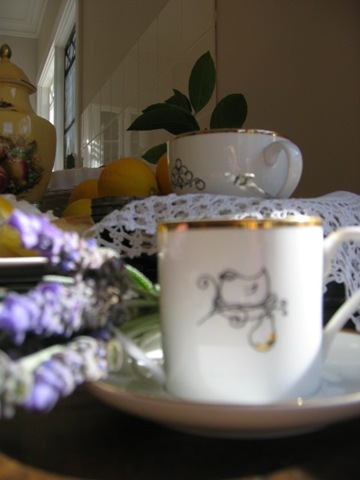 Gold trimmed tea cups and plates:Maxwell & Williams Designer Homeware. This was a special edition: The twelve days of Christmas. 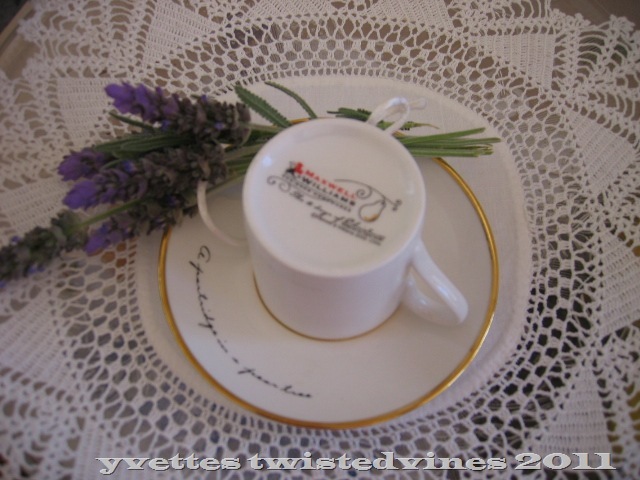 The tea cup below is Five Golden Rings, and each plate has it script written on the rim of the plate. 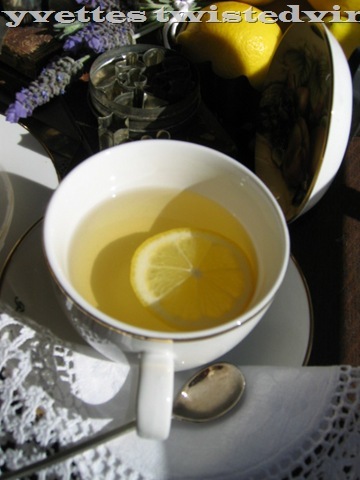 I served chamomile tea, relaxing, with this fragrant and flavoursome tea. Served with slices of juicy lemon rings. …a partridge in a pear tree. 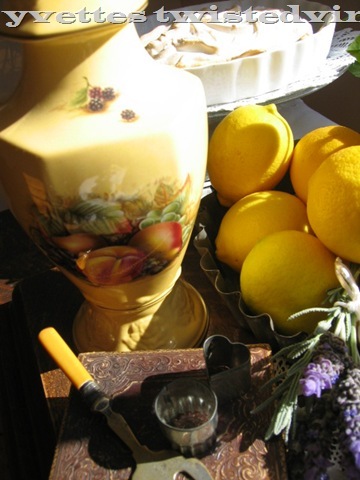 And English bone china pieces –Aynsley : Orchard Gold plate and urn. With the bountiful lemon tree overflowing with fresh lemons, I thought I would make the classic Lemon Meringue pie…LOL..this pie only uses three lemons! 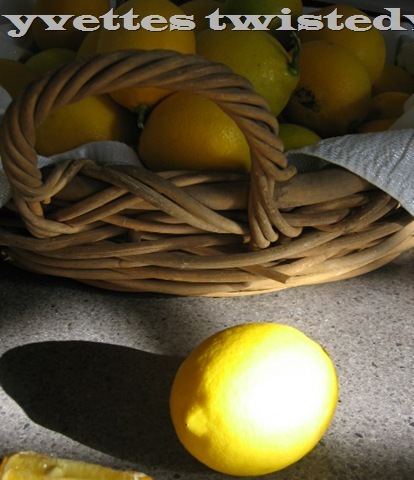 So does this put a dent in our supply of lemons…Answer, clearly no! But, we all enjoyed this pie. The pastry is light,flaky and crisp. The lemon curd tart –sharp tasting and I used an Italian meringue…Ohhh how delicious! Italian meringue is divine, glossy whipped peaks of egg whites and hot sugar syrup, soft clouds of meringue that melts in your mouth at every bite. Preheat oven to 190°. To make the pastry, combine flour,icing sugar and canola spread in a food processor, or if you like doing it like I do, and sharing the love I use my hands, Working the mix until it resembles breadcrumbs. Add 2 tablespoons of water and mix until combined. Sprinkle a little flour onto a sheet of baking powder and roll out dough to loosely line a 20cm flan tin. I then place in fridge for at least 5 minutes. Prick the base with a fork and bake in oven for 15 minutes until golden in colour. Set aside and allow to cool. Microwave lemons for 20 seconds, they’re easier to squeeze. To make the filling, combine cornflour,custard powder and sugar in a small saucepan. Add water, stir until smooth, then stir in lemon juice. Place over medium heat, whisk until mixture boils and thickens. I added a little more water and adjusted the consistency. Remove from heat and stir in egg yolks. Spread mixture into pastry case and let cool. I’d say the next time I make this pie I would consider doubling these amounts of the lemon curd filling. Now for the Italian Meringue, oh, I’m drooling just thinking about this topping. This type of meringue is already cooked, so you can leave the topping snow white or toast in a high oven for about 5 minutes or use a blow torch to brown the textured peaks of the meringue. In a small saucepan add the water and sugar, stirring continuously with a wooden spoon bring to the boil until the sugar dissolves. Reduce heat to medium ,cook syrup for another 10 – 15 minutes. Bring syrup to ‘hard ball stage’. Sugar concentration 92%. For more ideal tips check this link out here. Whisk the egg whites with the cream of tartar, until soft peaks form. Increase the mixer to high speed, gradually pour the hot syrup into meringue. Continue beating at medium speed until the mixture has cooled to room temperature , as the meringue goes from hot cooling to room temperature the meringue re-thickens and turns glossy. This will take anywhere up to 20 minutes. Golden meringue peaks in hot oven or with kitchen blow torch. 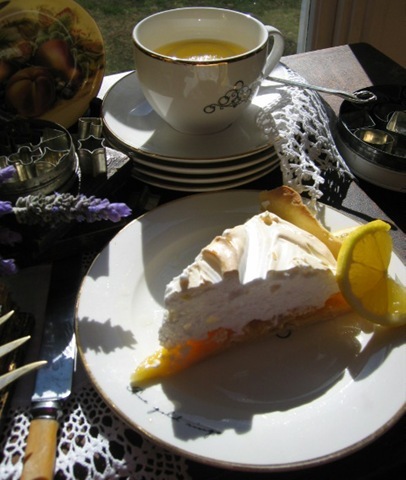 I served this Lemon Meringue Pie on its own or complete it with a scoop of fresh cream or vanilla ice-cream. So, an absolute delight of a sunny golden sunshine afternoon. So happy you’ve joined me. 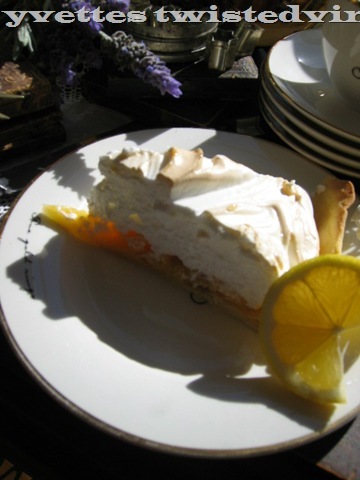 I too love lemon meringue pie and it is one of the things I make most and I love the idea of your Italian meringue. Your Lemon Meringue pie looks scrumptious! I also adore your Orchard urn – very pretty. Thank you for stopping to visit me. Have a great day! Your photos capture everything just wonderfully! The lemons are so fresh and pretty! The pie looks amazing and the cup of tea looks so inviting. Thank you for sharing your recipe with us. Would love to join you for a cup. Wishing you a delightful day. Oh my, your pie does look just delicious! Your beautiful photos show off your lovely china and treat. The cups are very pretty! Thank you so much for sharing with us today. What a Yummy and Delightful post! Oh My Goodness how I LOVE LEMONS and never pass on trying a new recipe. The Italian Meringue looks SO GOOD and I will definitely give it a try! Of Course this recipe will have Your Name in my Must Make File! OH How I wish I had a lemon tree! Nice pictures! Yellow is such a cheerful color and those lemons look so beautiful. Your tea and pie look delicious! Lovely tea post! 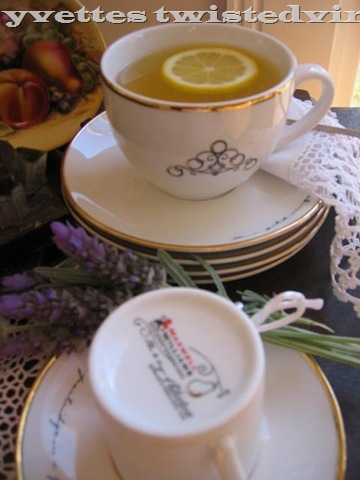 This looks amazing – love the teacup – what a cool idea – based upon the 12 days of Christmas! Lovely shots, only one snag. I now have Coldplay in my head! The citrus yellow seems to brighten up everything is comes into contact with. Love these photos. Such gorgeous lemons…yellow and cheery. The pie looks absolutely scrumptious! I can almost taste it…and smell the fresh lemon scent. What a wonderful, refreshing tea! Your lemon treats looks so delicious. 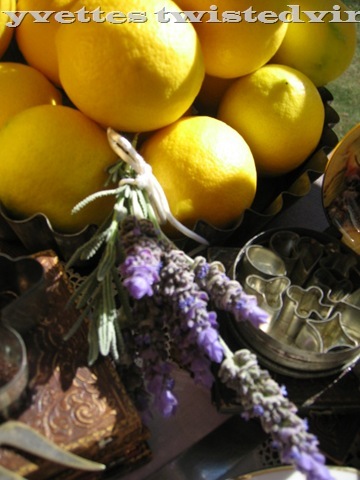 Thanks so much for your lovely comment my way.. and apologies for my tardiness.. internet and other issues making me slow these days..
What a pretty and yummy lemony tea post.., Oh my! Thanks for sharing the recipe also! Thanks so very much for joining us and we look forward to hopefully having you join us once again in a few days; it’s always a pleasure! What a beautiful and happy post! Great photos. What a bright sunny way to start my day! I sooooo wish I had a lemon tree and I am a big fan of lemon curd! What deliciousness~ thanks for sharing this! Hello Yvette, this is my first visit to your blog.That lovely first picture of pie and lemons cheered me up so much, it brought sunshine into my day…so thank you! This lemon table-scape is amazing. And I love the recipes that you’ve featured. 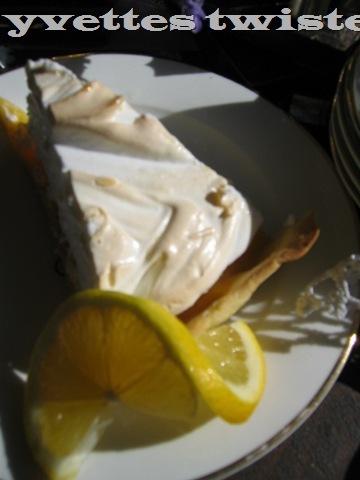 And that lemon meringue pie… priceless.